Review date: 14 April 2004. External hard drive boxes are not glamorous products. They certainly can be useful, though. Especially the ones that give you a couple of different ways to hook them up. I found myself in need of a big old slab of carryable multi-interface storage, so I pried my wallet open and actually paid for one of these. I didn't know I was getting the bling bling gold edition. The picture on the package showed a silver one. No matter. 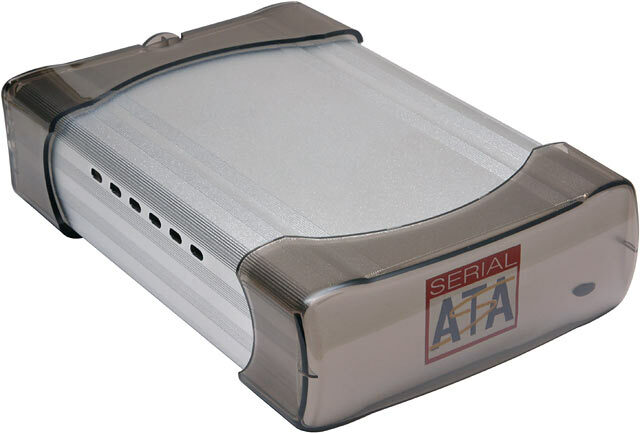 This is the SNT ST-2316C USB 2.0 and IEEE-1394 (FireWire) external box for standard 3.5 inch Parallel ATA (PATA) hard drives. SNT, in case you're wondering, apparently stands for Sunnytek Information Co, Ltd. You're probably wishing you hadn't wondered, now. Apart from the odd manufacturer name, this is a pretty neat piece of external storage hardware for the money. Here in Australia, Aus PC Market sell this box for $AU148.50 including delivery anywhere in the country. You'll need a hard drive to put in it, of course, but any vaguely recent PATA drive will do (the box supports Ultra DMA/66 and higher). I didn't test the box to see if it'd work with old UDMA/33 and slower drives, but I figured it probably would; a reader's now confirmed that it does. If you're using something that old then it's probably got 20Gb or less capacity, though, and even 20Gb isn't a lot these days. If you're going to go to the trouble of carrying around a full-sized external drive like this, you might as well put a newer drive in it. Quite large drives are available very cheaply on eBay, and new ATA drives, of course, more closely approach zero cents per megabyte with each passing day. The drive I picked to use in the ST-2316C is a 250Gb, 8Mb-cache Western Digital. 250Gb Parallel ATA drives are the current capacity-per-dollar winners; Aus PC Market sell this one for $AU368.50 including delivery. The box is 206mm long by 132mm wide by 50mm high (8.1 by 5.2 by 2 inches), and with a drive in it you can expect it to weigh about 1.1 kilograms (2.4 pounds). Unless the place you're going to has a suitable 12VDC plugpack sitting around, you're going to have to take the ST-2316C's power supply with you as well. That's about another 200 grams (seven ounces). Still, 1.3 kilos and $AU517 ain't bad for 232Gb of portable storage. In the olden days, external hard drive boxes were often slow (because FireWire and USB 2 didn't yet exist) and quirky (because the "bridge" hardware they used to translate ATA into whatever interface they used was not fully baked) and annoying to set up (because they were just plain badly designed, with little squished-in cables, questionable screw hole alignment, and so on). The SNT box has none of those problems. The back of the ST-2316C has a full suite of connectors - one barrel socket for power, one square Type B USB socket, one standard six-pin powered FireWire socket (don't get excited - the box can't run from FireWire power), and one four-pin mini FireWire socket. And a little sliding power switch, and two screws. The two screws are all that retains the drive tray inside, and they're captive (they can't fall out and get lost), and the box comes with them already loosened. Three points to SNT. Here's the tray. The heat-sinky aluminium extrusion exterior of the SNT box doesn't actually do much, because the tray you screw the drive onto is plastic; there's no all-metal heat conduction path to the outside. 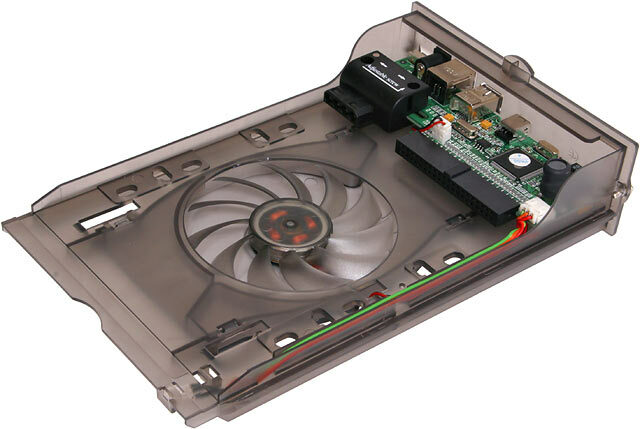 But there's a low profile, reasonably quiet cooling fan built into the tray. It breathes through slots in the sides and back of the case when it's assembled, and it should keep any 7200RPM drive quite cool enough, assuming non-lethal external ambient temperature. It's noisy enough that silent computing freaks won't want one of these cases, but if your PC is as loud or louder than an ordinary one-fan-in-the-PSU clone, you should be fine with it. I wouldn't put a 10,000RPM ATA drive in this enclosure if I were you, but nobody's likely to want to anyway; dropping dollars on a steaming server drive and then putting it behind performance-reducing bridge hardware is not a sensible act. 5400RPM or slower drives will run even cooler than 7200RPM, of course; hard drives heat up primarily because of air friction on their platters, and the slower they spin the less heat they make. Note the complete absence of cables in the above picture. No ribbon cable for data, no little four-wire lead with a Molex plug for power. 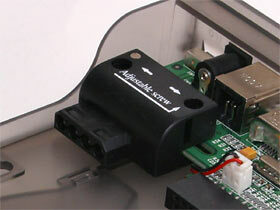 The drive, instead, just plugs straight onto connectors built into the bridge hardware board. But how, I hear you ask, can this arrangement deal with drives whose power connector doesn't quite line up with the one on the board? By sliding the connector, of course. There's one screw to lock it in place, or let it slide. Niiiice. 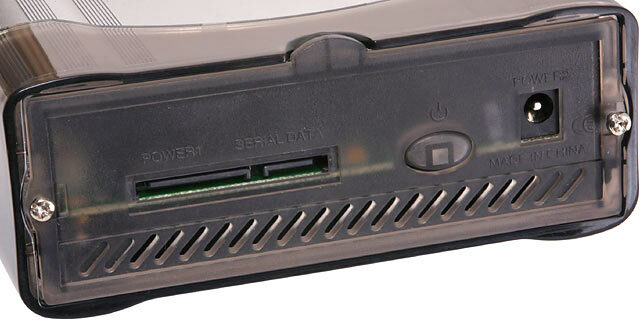 The ST-2316C comes with four super-wide-head screws for mounting the drive; the big heads spread the strain over more plastic than a regular screw would. Everything fits very neatly. 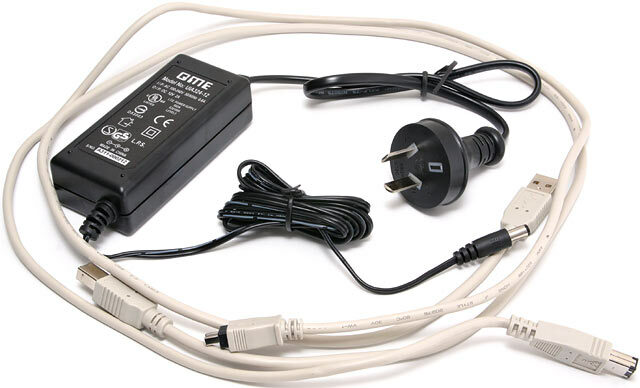 Along with the box itself, you get the power supply (100-240V, 50/60Hz, world-compatible), and also get USB and FireWire cables. This is a very nice touch. Many dual-interface external drive adapters come with only one cable, or even none at all. There's also a basic but adequate paper instruction sheet, and a floppy disk with Win98SE drivers on it. Users of current Windows and Mac OS flavours can just plug and go with the SNT box, without installing any drivers. So, maybe, can users of recent editions of Linux; I haven't tried this box with Linux, and I know from past experience that USB and FireWire storage isn't necessarily as smoothly cross-platform as it ought to be. For the benefit of Linux driver hunters, chip aficionadoes and the merely nosy, I checked out the bridge hardware the SNT box uses. It's got one bridge chip for each interface. One Oxford Semiconductor OXFW911 IEEE-1394 to ATA bridge (PDF datasheet here), and one Cypress Semiconductor CY7C68300 USB to ATA bridge. I checked the speed of the 250Gb WD drive when connected to my Abit IC7-based PC's PATA controller, and then in the ST-2316C. I used Futuremark's PCMark04 for the test, because it takes long enough that I reckon it's doing something, without taking so long that spacefaring civilisations can rise and fall before the tests conclude. Or generating semi-random numbers for storage speed tests, for that matter. In FireWire mode, the SNT box didn't greatly reduce the drive's straight ATA performance. The "XP Startup" test scored exactly the same (well, actually 0.1% faster in FireWire mode, but that's experimental error), and everything else was a bit slower, giving an overall score of about 87% of the drive's previous speed. If the box supported FireWire 800 then it might perform a little better, but not much; FireWire 800 has twice the bandwidth of the more common, original, FireWire 400, but it can't magically make a drive faster than it is natively. Since most computers don't have FireWire 800 yet anyway (it's standard on new Macs and available, though uncommon, in the PC world), it's really no loss at all. Actually, it's simpler; FireWire 800 uses different connectors from FireWire 400, so owners of FireWire 400 systems have to buy a new cable in order to plug FireWire 800 devices in (and have them run at FireWire 400 speed). USB 2 mode was slower than FireWire, but still managed an average score of 74% of the drive's native performance, with no disproportionately high or low results. In both tests, straight file copying speed took the biggest hit. FireWire managed only 69% of native ATA speed for PCMark04's File Copying test, and USB scored a mere 59%. But that's still 18.6 and 16 megabytes per second, respectively, and it's for two-way copying of relatively small files. When I just dumped 1.36Gb in two files to the external drive over USB 2.0, it took only 71 seconds before the ST-2316C's oval bi-colour power-and-activity light stopped flickering red and went green again. That's 19.6 megabytes per second. Read speed for files of this size over USB 2 was a bit faster; around 21.8Mb/s. I pared a few more seconds off the write time by turning on write caching for the drive, but write caching for removable devices is off by default in current Windows flavours for a reason. Without it, write operations are finished when they look as if they're finished, and you don't have to bother with any of that "Safely Remove Hardware" stuff to make sure all the bits you think you've copied have actually made it to the platters. Next up, I tried hooking up the box to a USB 1.1-equipped computer (with plenty of CPU power, not that it mattered), and ran PCMark04 again. The drive speed test crashed, presumably in disgust. I had a lot of data to shift, and was in no particular hurry to shift it, so I did it on that system. 34.6Gb, over USB 1.1, maximum theoretical bandwidth 12 megabits per second (1.43 megabytes per second), maximum user-data bandwidth rather lower. It took 13 hours and 23 minutes. That's about 750 kilobytes per second, which is a decent score. It's about 1.5 times the write performance of many cheap USB "memory key" gadgets and MP3 players. Read speed for big fat files like these was better, as it usually is - almost 970 kilobytes per second. Aus PC Market do have stock of a silver SNT drive box. This one. 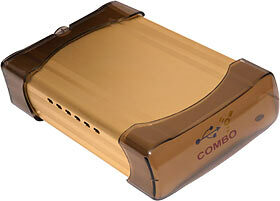 This is the SNT-2316SATA, which is confusingly shown in gold on the SNT product page. Maybe both drives come in both colours, and it's the luck of the draw which one you get. Cosmetics aside, the SNT-2316SATA is physically very similar to the ST-2316C, but it's a simpler gadget. All it does is let you use a SATA hard drive outside your computer's case, provided you have a SATA controller in the computer. Aus PC Market sell it for $AU137.50, including delivery. 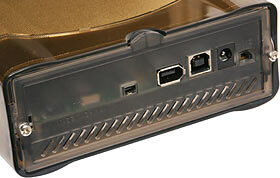 The back of the box has a full power-and-data SATA connector, plus another barrel-plug DC input jack; it can run from either. There's a pushbutton power switch. Inside, the tray's the same, except for the much simpler passthrough circuit board. You also get less stuff with the SNT-2316SATA; just a SATA data cable, power adapter and instruction sheet. 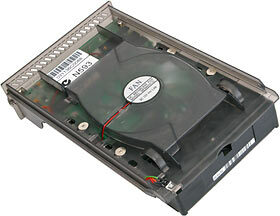 The SNT-2316SATA has the same sensible design and decent cooling as the ST-2316C, and it uses normal SATA connectors, unlike the rather peculiar Highpoint "e.SATA" box I checked out a while ago. It will also, of course, give you 100% of the performance you'd get from the same SATA drive installed inside your computer. SATA drives can now be had for not a lot more money than PATA ones (Aus PC Market sell the SATA version of the 250Gb Western Digital drive for only $AU16.50 more than the PATA version), so there's no problem there. The SNT-2316SATA is about as cool as an external SATA box can be, and it can't help but be a bit faster than the ST-2316C. But if you want a general purpose external storage solution, you want a USB/1394 box. Apart from the fact that plain SATA drives aren't really hot-swappable - you can plug and unplug without blowing anything up, but don't expect your operating system to be happy - you just won't be able to connect the SNT-2316SATA to many computers. 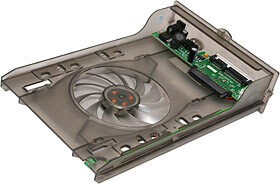 No normal computer has a SATA socket you can access without fumbling around on the motherboard or an expansion card (very few of which have rear panel connectors), and many computers have no SATA at all. Every slightly current PC has at least USB 1.1, though, and USB 2.0 and/or FireWire are pretty common these days too, and hot-swapping those interfaces is no problem. There are lots of external drive boxes on the market, but the ST-2316C is a good one. Recommended. Readers from Australia or New Zealand can purchase these drive boxes (and drives to put in them!) from Aus PC Market. If you'd like to buy an ST-2316C, click here! If you'd like to buy an SNT-2316SATA, click here! WiebeTech's ComboDock is the minimalist alternative to an external drive box!